Pack of 10 or 30 Christmas Cards on 5x7 Velvet Cover, a heavy, distinctive paper with a smooth velvet-like finish. It is very easy to write on! Also included are A-7 white wove envelopes 24 lb., in a clear plastic package. This paper is also comprised of 10% post-consumer waste, reducing its environmental impact. Surcharge rates apply to orders sent outside of the contiguous United States .Please inquire. Thank you for your understanding. 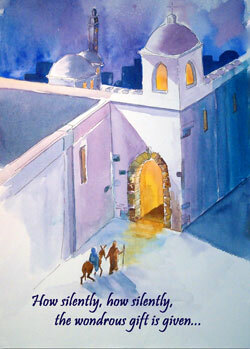 Christmas Card: "The Wise Still Seek His Face"
Pack of 10 or 30 Christmas Cards on 5x7 premium 14-pt. glossy card stock, with 24 lb.A-7 white wove envelopes in a clear plastic package. Surcharge rates apply to orders sent outside of the contiguous United States. Please inquire. Thank you for your understanding. Twenty 6" x 4.25" postcards on 13-pt 100% recycled matte card stock in a clear plastic bag $4.95. In the dark of that first Christmas Night the Light of the World was born! 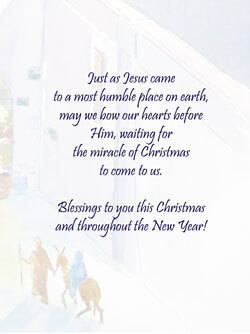 May the Blessings of Christmas be yours throughout the New Year!